If your “décor” Pinterest page is a testament to minimalist home design elements like frameless shower doors and floating vanities you’re not alone. The less-is-more trend continues to seduce the masses. And with the look’s focus on clean lines, organic materials and high-quality pieces, it’s no wonder people are enchanted. Thankfully, pared-down design is easier to pull off than it might seem, especially in a smaller space. If you’re not ready to commit to the look in every space, the bathroom is a great place to experiment. From vessel sinks to floating vanities, here are three minimalist bathroom elements you never knew you needed (until now, of course). There’s something to be said for a sink that stands alone. This sleek trend often involves mounting the water basin directly to the wall, but vessel sinks can also sit on countertops, low-hanging shelves or other minimalist design elements like floating vanities (see #3). These sinks also tend to be incredibly versatile. While one bathroom might benefit from a rectangular lava stone basin on a dark countertop, another could require a shallow glass sink mounted to a wooden plank to make a statement. Another vessel sink “pro” is that it’s a classic design element that won’t go out of style. If your love for minimalism fades over time, the sink can be integrated into a different remodel without clashing. These easy-to-install sinks also have the advantage of ergonomics, as the height can be adjusted to accommodate those who most often use the bathroom. 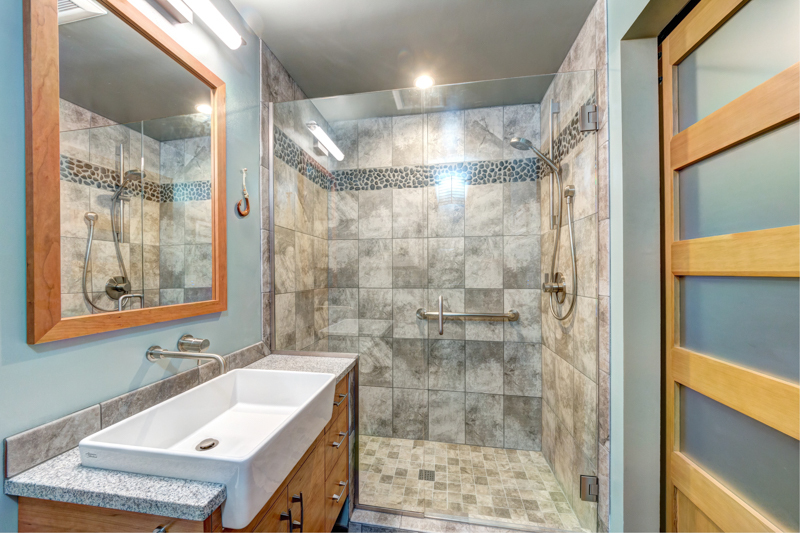 In addition to its clean aesthetic, frameless shower doors are a great investment. They tend to last longer and are easier to clean than their framed counterparts. Frameless shower doors better retain their structure over time, ensuring that shower-goers won’t ever need to wrestle with wobbly slide doors. Not to mention, these highly-customizeable doors also tend to give the bathroom a high-end look. There’s also an element of practicality: The doors minimize potential mold build-up—something many homeowners struggle with, particularly in the Pacific Northwest. Framed doors tend to collect water build-up, which can lead to mold and mildew growth. With frameless shower doors, the water finds its way to the drain. A few swipes with a squeegee, and the shower is easily cleaned. Besides, nothing says “minimalist” quite like a shower built with pure glass, especially one that shows off the natural tile design and chrome rain showerhead you so carefully selected. Minimalist design is all about choosing items that maximize the space. One way to free up some room? Ditch the clunky cabinets and install a floating vanity. These elevated countertops give the room an airy feel, often without sacrificing the drawers that store washcloths, toothpaste or other bathroom essentials. Floating vanities also make great bases for vessel sinks and can be found in several natural materials that pair well with any aesthetic. 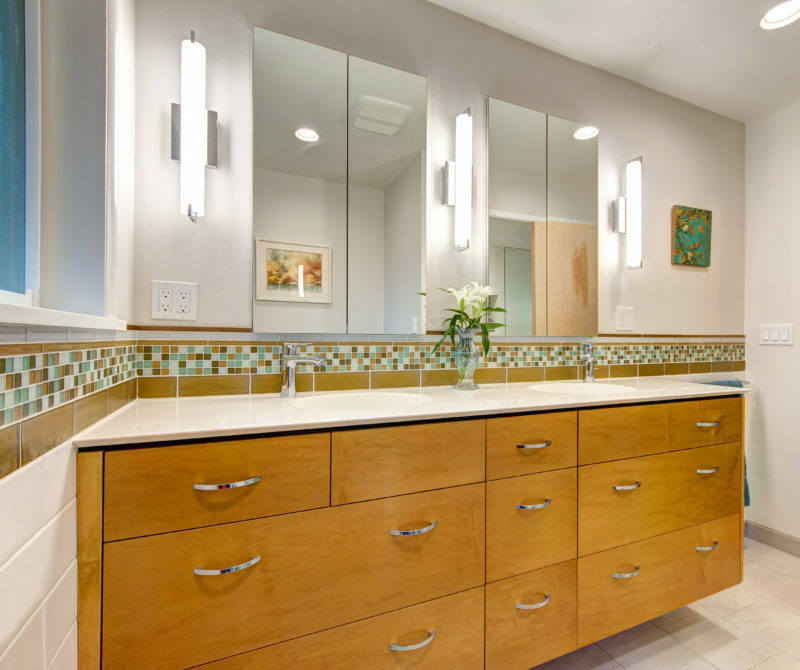 Also called a “wall-mounted vanity,” this design element has gained serious popularity in recent years. Some of the hype has to do with versatility (the materials, sizes and shapes are endless), but many people love that floating vanities can be easily moved from place to place without redesigning the entire bathroom. Ultimately, minimalist design is one way to take back your space, creating a relaxing oasis without all the clutter. From floating vanities to standalone vessel sinks, these design elements help give even the smallest bathrooms a spacious, open feel. Embracing even one of these ideas can set you down the path toward pared-down perfection. 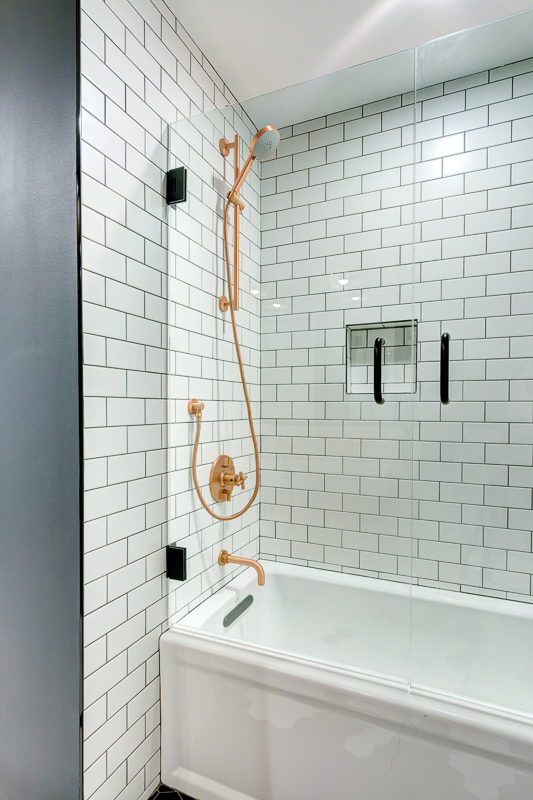 Next time you wash off a stressful day under the stream of a rain showerhead behind pure-glass frameless shower doors, you might find “less-is-more” has become your new mantra.